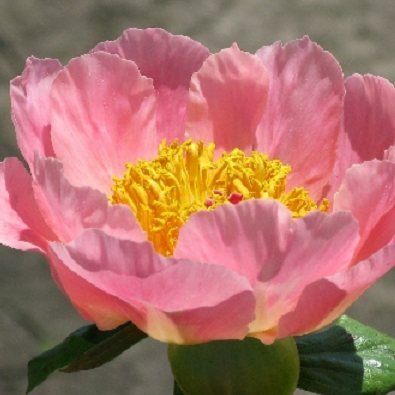 Single; medium, abundant flowers of heavy substance, much fluted large petals of coral pink, surround a medium size cluster of yellow stamens. Warm red accents by the stigmas at center. Very erect stems topped by one or occasionally a second flower a few inches above the leaflets make a compact, upright bush, which stands on its own strength. 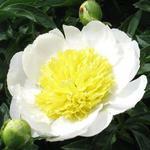 Flowering with the late opening tree peonies (Paeonia suffruticosa). For landscape use, recommended only for regions where spring warm up is not interrupted by harsh late freeze. 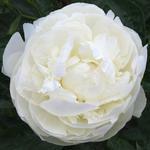 Herbaceous Hybrid.�Parentage: unknown. Presumed tetraploid; fertile, has pollen and seeds.�Candidate for breeding. Use tetraploid pollen. Peony accession # 1902. Parentage unknown. First bloomed and first propagated before 1995. 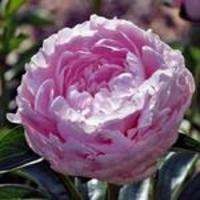 SINGLE, with 10-12 heavy substanced, much fluted large petals of coral pink (RHS 41A-D). Four and a half inch flowers, one per stem, occasionally a side bud. Staminodal disc not well developed, a few projections, pink. Typically 4 carpels, green (RHS 145B), moderately hairy, bearing red stigmas (RHS 47B). A medium large cluster of stamens, filaments yellow but may show some red streaking, fertile pollen. Produces seeds. Freestanding upright growth, 32-34 inches, foliage green, leaflets broad pointed, heavy substance, shiny surface. 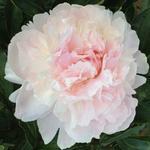 Early bloom season, flowering with the later opening Suffruticosa Group woody peonies. It is seriously flawed, however, because of vulnerability to flower bud damage from late freezes as it performs in American Central Midwest climate. For landscape use, recommended only for regions where spring warm up is typically not interrupted by especially harsh weather fronts. Candidate for breeding.